It's pronounced "crack-en", you know. While the release date may have been pushed back to August, Disney Infinity is alive and well. As proof, there's a video! And it's got pirates! The new teaser shows off the Pirates of the Caribbean Play Set, complete with sword fighting, cannons firing, ships sailing, and Jack Sparrow being a general snark as he slides across ropes. And yes, a Kraken is summoned. Because you're kinda required to do that at this point. Disney Infinity is an unusual sort of game that takes characters from popular Disney franchises and packages them in different "Play Sets". These sets are sold separately and come with an actual, real world figurine that can be placed on the "Infinity Base" to make them appear in the game. Once they're digital, you get to run around their universes action-adventure style. You can even combine characters and environments from different sets in Toy Box mode. It's a similar sort of set-up found in Skylanders Giants. 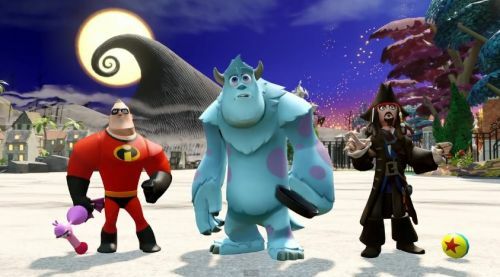 Disney Infinity is scheduled to hit PS3, Wii U and Xbox 360 on August 18. Co-op will support two players locally and four players online.